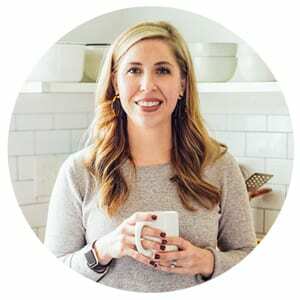 Can I share with you a little meal planning secret? I’ve been using the same meal plan for breakfast and lunch since school started back in August. And you know what? I love this! I love that I only have to sit down and plan dinner each week (from a list of favorite meals, and some “to try” meals that peak my interest). 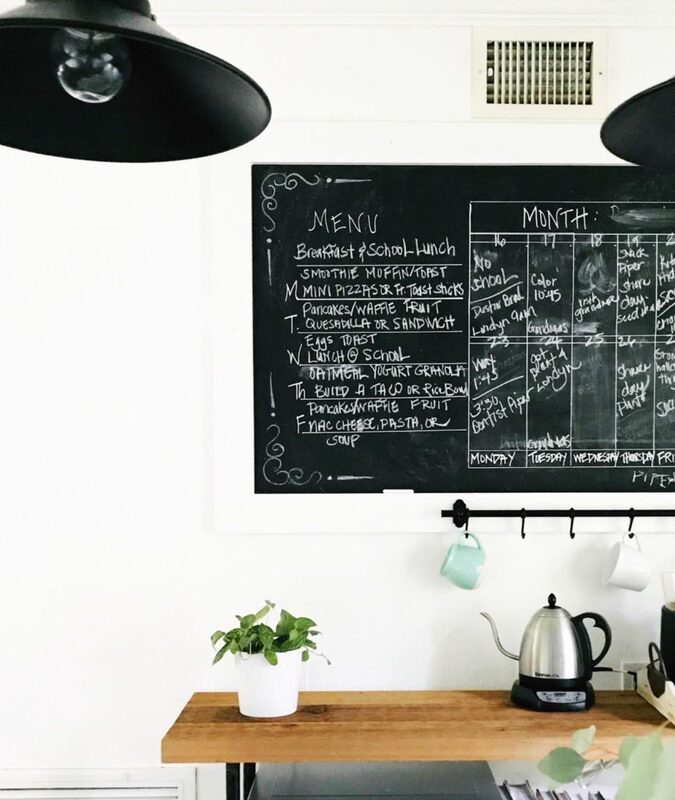 That, my friend, is how I’m simplifying life right now–consistency and routine (in the form of a rotating weekly menu) for breakfast and lunch, and variety and spontaneity for dinner. I do add variety to this set plan by incorporating different fruits and veggies as they go on sale and now with the changing seasons, but for the most part, these meals are consistent and unchanging. Does my family get bored with this predictability? Not yet. Will I change my plan in the future? Definitely. Maybe I’ll create a new plan for breakfast and lunch in January, which we can use for the remaining months of the school year. Without fail, carrots and celery are always served on the side of the lunch mains. Why? Because both are inexpensive (whether they’re from the local market or purchased from the grocery store) and both foods are staples in my fridge since they’re so versatile. 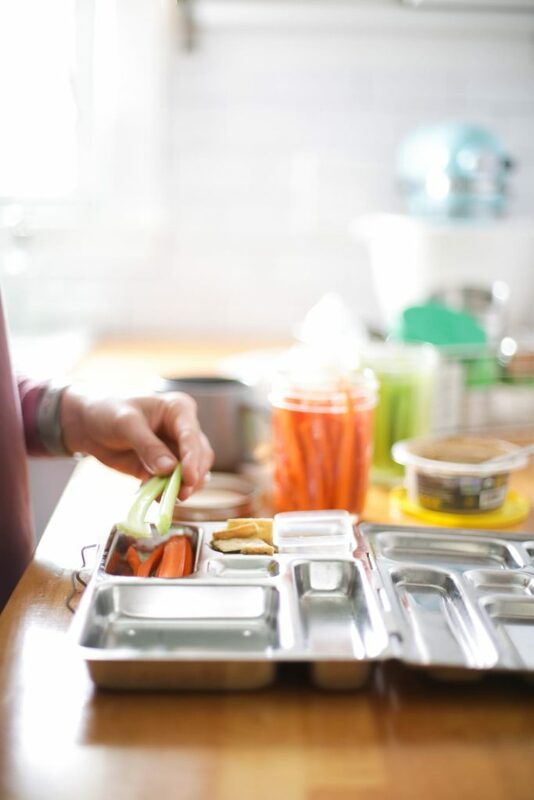 Some weeks the lunchbox carrot and celery sticks are served with a dip (like a homemade ranch, hummus, or a roasted eggplant dip). I personally don’t like to cut veggies every single morning, so I’ve added this task to my weekend prep time. It takes about 10 minutes for me to cut a bunch of carrot and celery sticks. I also cut some apple slices (soaking them in lemon juice and water before adding the slices to a storage container) and cucumbers. That, my friend, is time well spent. And doing this shaves off precious minutes from my morning routine. Those precious minutes, as all parents know, are incredibly valuable on a busy school morning. Every second counts. 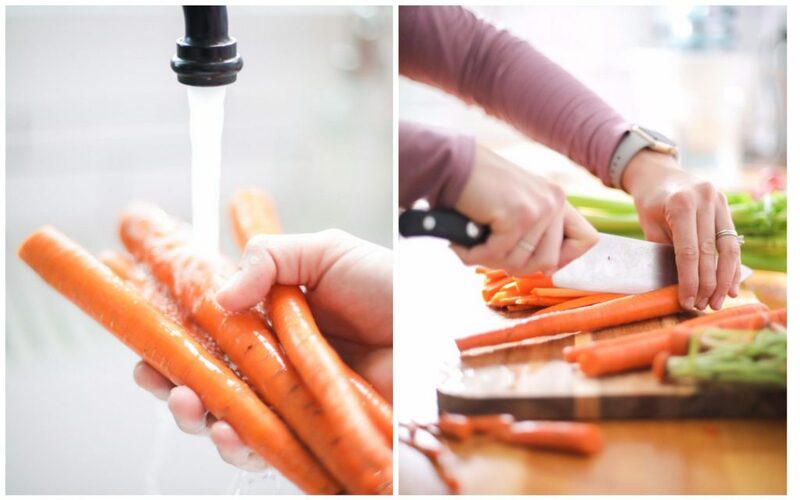 If you’ve ever prepped carrot or celery sticks in advance, you’ve probably run into a major issue: limp, dry veggies. For a while, I continued to prep these veggies, despite this issue. I figured no one noticed how dry the carrots looked (and tasted) and how limp the celery was. My assumption was wrong. After weeks of sending these veggies in the kids’ lunchboxes, Piper spoke up, “Mom, I don’t like the carrots in my lunch. They don’t taste good. 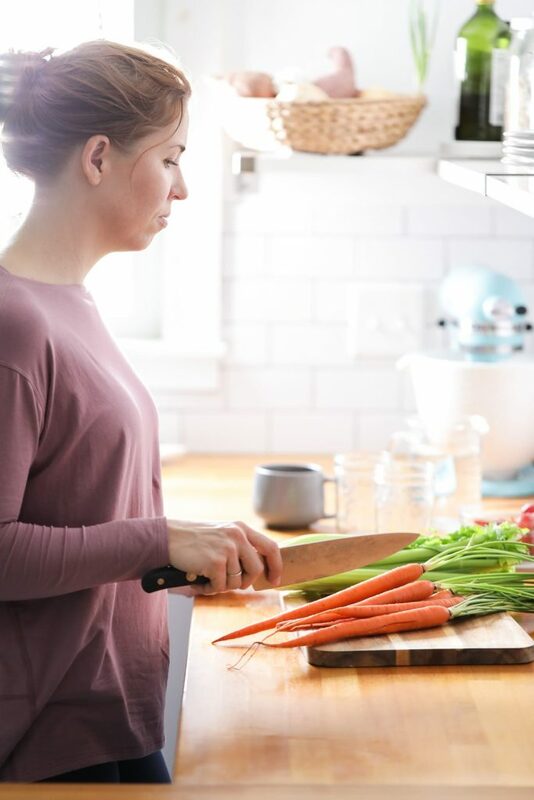 And they’re so dry.” At the time, I didn’t know how to fix the issue, other than going back to slicing the carrots and celery each morning. 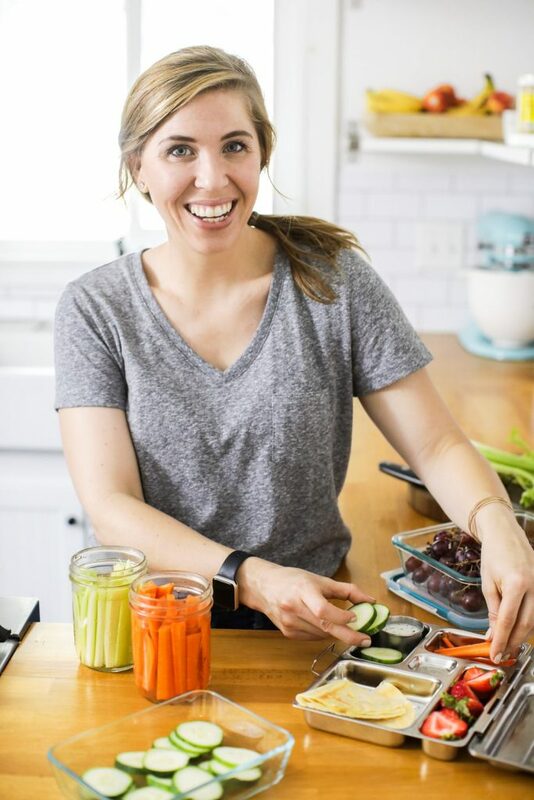 I immeadiately tried out the “hack” in my own kitchen–slicing carrots and celery and then placing the “sticks” in mason jars filled with water. The cut carrots and celery remained fresh and crisp for the rest of the week (7 days). 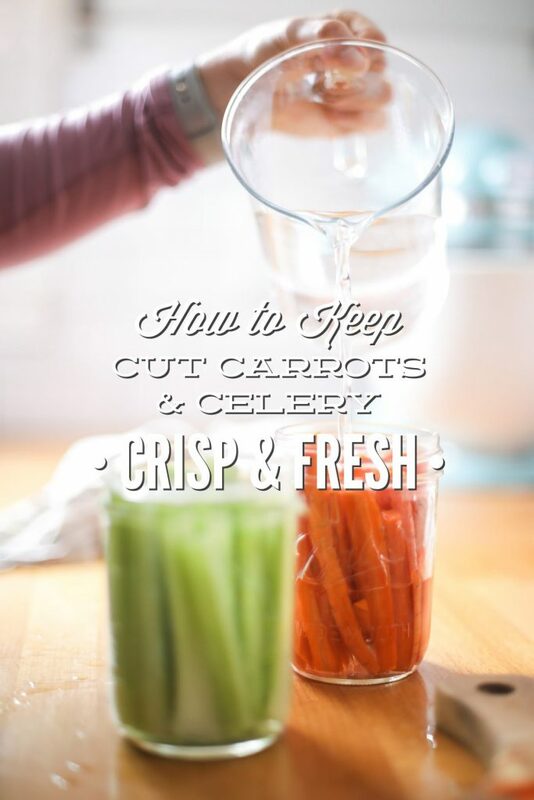 I’ve been using this hack to keep carrots and celery fresh and crisp for months now, and it hasn’t failed me once. The veggies always taste and look amazing, even on day seven. I’ve already described how this hack works, but I’ll spell it out in a more step-by-step way, below. Plus, there’s a video. 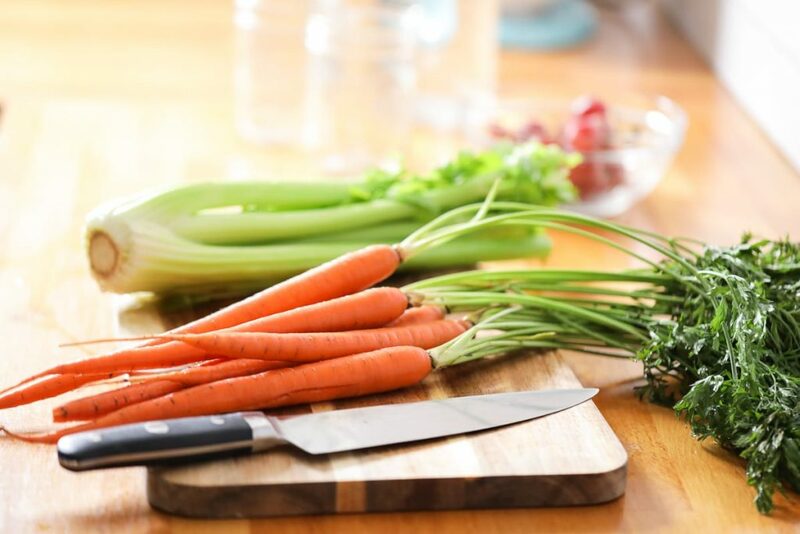 Cut the carrots and celery into the desired sizes: sticks, coins, etc. 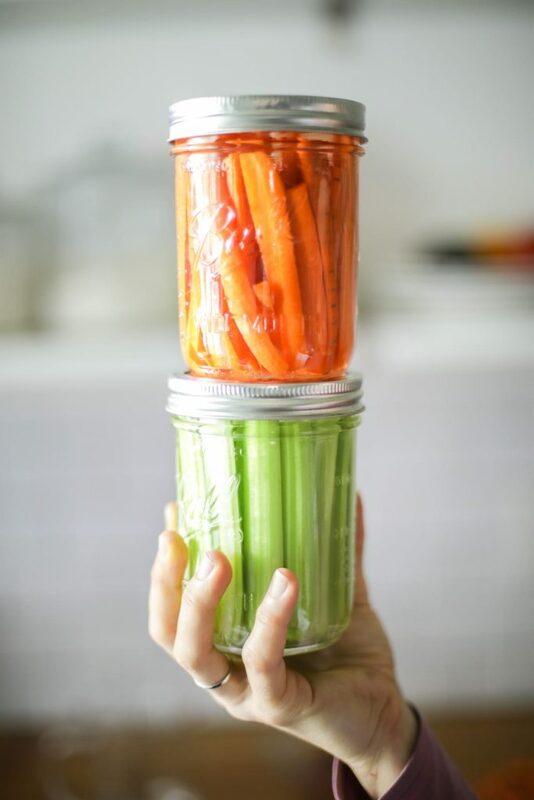 Add the carrots and celery to mason jars or storage jars. I’ve found that wide-mouth mason jars work well for “sticks” since the pieces can stand up in the jars. Fill the jars with filtered water. Secure the lids on the jars. Store the jars in the fridge for up to a week (I’ve gone a bit longer, too). Add fresh water to the jars every few days to keep things fresh. Thank you, Cynthia! I’m so glad the post was helpful for you. For pepper sticks, I slice them up and place them in the same mason jars, but don’t add water. They stay moist without any extra assistance (water). For cucumber slices or sticks, I use a flat glass container, and place a paper towel at the base of the container and then add the cucumbers. This seems to help them stay moist, but not get slimy for a few days. Hope that helps! With Xmas coming, time is an issue with my carrots cut in Xmas trees. Have you tried this with jicama? Hey Terry, I haven’t, but I bet it would work well. Can you put celery and carrots in the same container? Thanks for posting these tips. I’m trying to pre-prep a weeks worth of ‘mini vegetable tray’ snacks. I’ve cut everything up (carrots, celery, orange bell peppers and broccoli) and attractively placed them all together (touching) with grape tomatoes in small tupperware. I am now realizing they might not preserve well in the same container for more than a day or two. Any tips on how this could be done better? I’d like to be able to just grab a ‘mini tray’ or two with a lite ranch dip cup to snack on without having to fenangle with multiple containers or additional prep, if possible. Oh, and snap peas are also in the mix, in case it makes any difference. Based on your comment to Gary, I might opt to put carrots and celery in one container with water (which I’ll dump right as I pull it out), and put the other veggies in another. Two containers wouldn’t be the end of the world, but 5 or 6 starts to feel like it. 🙂 Any insights are appreciated. Hey James, I think you’ll be okay for a day or two. You could add a moist paper towel to the base of the container to keep everything moist (avoid the dried out look). I just did that this weekend! I didn’t fill up the jars though, so I will go back and do that. Thanks for the tips! 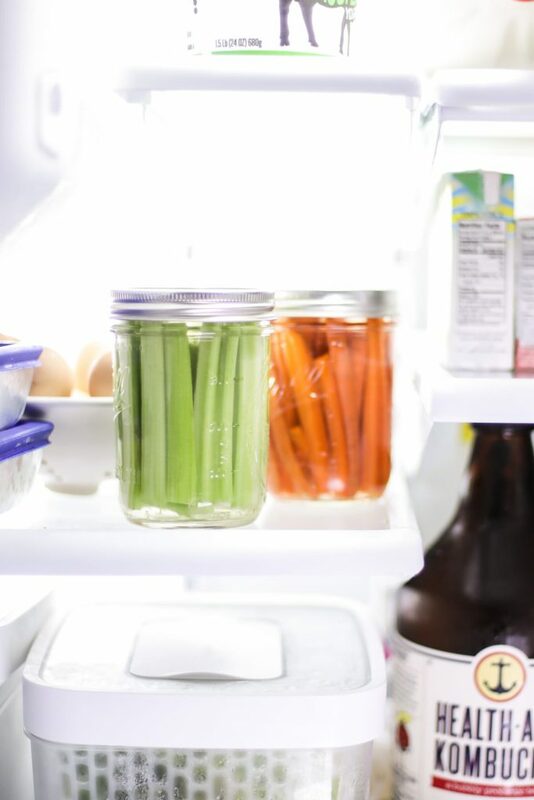 Has anyone tried storing the celery sticks in water and in a mason jar mason for about 3 weeks? Mine stayed fresh–flavorful and crispy. Hey Robert, That’s great. I would just change out the water every few days. My sister does that sliced carrots and put in a jar of water. I just opened a jar and was startled that it spewed up and sizzling bubbles like opening a carbonated bottle!!! I asked her how long ago did she put together the carrots. It was about two weeks. I just googled and should be 7 days. We tried the carrots and they tasted all right but I told her when under suspicion, throw them away. I was thinking carrots are sweet and could have fermented???? Hey Barbara, Sounds like they started to ferment, as you mentioned. I recommend changing the water every couple of days to prevent this and opening the jar often (hopefully you’re using the carrots often). 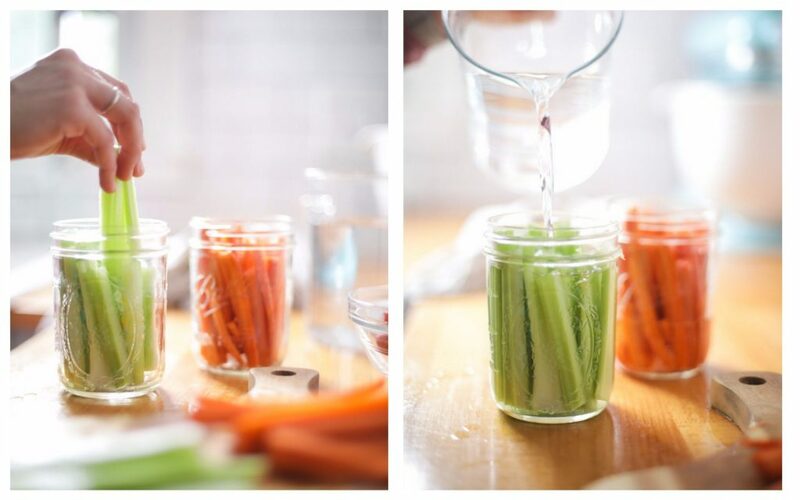 what size mason jars are you using for the celery and carrots? This process also worked well for shredded lettuce & cabbage. I prefer shredded lettuce for tacos & burgers instead of leaf lettuce. I kept in the fridge at least a week & it didn’t wilt this way. Wow, that’s fantastic, Charolette. Thank you for sharing. I heard you shouldn’t us an air tight container? Hey Matty, Can you share this source? If you don’t feel comfortable, use what you feel most comfortable with. I personally find air-tight containers work best.